This "Historically Speaking" column appeared in the Exeter News-Letter on Friday, August 19, 2011. When John Wheelwright arrived in 1638, a religious outcast from Massachusetts Bay Colony, it had already been decided – by someone – that the area was to be called Exeter. Before gaining its English name, the place was generally referred to by its proximity to the river – the Squamscott River, or sometimes the Piscataqua River, but it never seems to have been called simply ‘Squamscott’. There is no evidence that Wheelwright named it Exeter. He wasn’t from Exeter, which is located in the south western part of England, he was from Lincolnshire, which is 240 miles to the northwest. Charles Bell, author of History of Exeter, NH, noted that, “of course this name was borrowed from Exeter in England. The cause of its selection is unknown. There is no evidence that Wheelwright ever had any acquaintance with the English Exeter, and the only one of his companions who is known to have come from that place, or its vicinity, was Godfrey Dearborn.” So, we don’t really know who decided upon the name. We can, however, look to other towns named Exeter to see how the name spread around the world. There are at least 13 Exeters in the United States according to our most reliable source, the National Weather Service. Two of these, Exeter Green, Maryland and Exeter, Virginia, aren’t really towns at all. Exeter Green is called a ‘populated place’ on the U.S. Census, whatever that means. Two more Exeters can be directly linked to Exeter, New Hampshire. Exeter, Maine, population 997, was named by some of its original settlers who were from Exeter, New Hampshire. 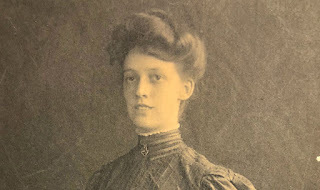 Exeter, Nebraska, according to Nebraska Place Names, by Lilian Fitzpatrick, was so named because it was, “suggested for this town by a family that came to the neighborhood from Exeter, New Hampshire. The name happened to fit in with the alphabetical system of naming towns along the Burlington railroad, so it was adopted.” It sounds like Exeter, Nebraska, came within a hair’s breath of being named Epping. The remaining Exeters in the United States- those in Wisconsin, Connecticut, Missouri, Illinois, Rhode Island, Pennsylvania, California, and Michigan- were all named for Exeter in England. Each one seems to have some major claim to fame. Exeter, Missouri, was originally named El Paso. Exeter, California is famous for a 1929 Anti-Filipino Race Riot. The best story of all, short of our claim as the UFO Capital of New England, is in Exeter, Rhode Island. Their town Wikipedia entry boldly states, “Exeter is noted by folklorists as the site of one of the best documented examples of vampire exhumations: the Mercy Brown Vampire incident of 1892.” There’s definitely a story there. Australia has three places named Exeter. Exeter, New South Wales, population 397, is most famous for its fatal railroad accident in 1914. Exeter, South Australia, is actually a suburb of Adelaide and doesn’t seem to consider itself an actual town. Exeter, Tasmania, with a population of only 339, is located in Tasmanian wine country, although there do not seem to be any vintners who print “Exeter, Tasmania” on the label, which is a shame as something like that would make a fabulous Christmas gift. Exeter, New Hampshire, home of the annual UFO Festival and former home of the Alewife Festival, is sadly and soundly outdone by Exeter, Ontario. Bragging that it is “Home of the White Squirrel” – a genetic variant of the lowly gray squirrels seen around here – the town hosts the annual White Squirrel Festival , primarily a folk music event, each May. The town mascot is Willis the White Wonder, who appears at many local events. We just don’t have anything like that. Outside of Exeter, England we are the largest Exeter in terms of population. 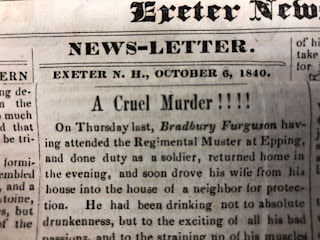 Here at the Exeter Historical Society we often get emails requesting information about the other Exeters. Occasionally, this has led to hours of time searching for records for someone who lived hundreds of years ago in another state, but more often we’re able to quickly realize that they’re looking for the wrong town. To the best of my knowledge, there have been no vampire exhumations here. 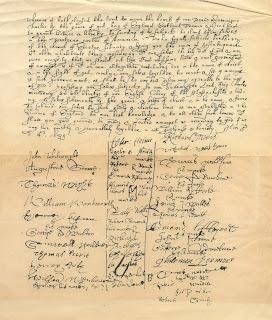 On July 4th, 1639, John Wheelwright, the founder of Exeter, New Hampshire, penned a document called “The Exeter Combination”, a framework for the town’s governance (see above). 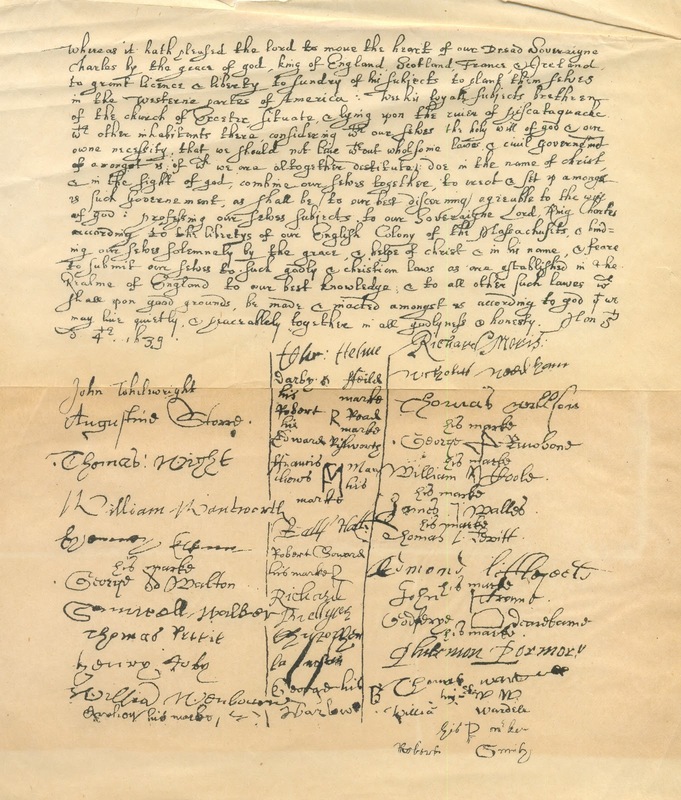 In his own handwriting, he spelled the town’s name “Exceter.” The misspelling shouldn’t trouble current residents – he incorrectly spelled his own name “Whelewright” later in the same document.